Condensation can reasonably be described as a modern disease of buildings. Why is condensation a modern problem? Modern building standards have aimed at achieving higher insulation and lower natural ventilation levels. Living habits: Westerners now have much better facilities in their dwellings for washing, cleaning and cooking. Higher living standards and smaller family sizes have allowed many householders to take a bath or shower once a day instead of once or twice a week, which was the norm in the early 50’s. Washing appliances such as clothes dryers (which require direct venting to the outside air) are much more common nowadays. 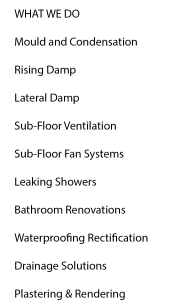 All these factors have helped to increase the amount of moisture generated in dwellings. Expectations: People are demanding more from their buildings nowadays. They are thus becoming less tolerant of deficiencies such as dampness because of increasing awareness of its known adverse health effects. What may have been accommodated 20 years ago is now no longer accepted by most people. Air within buildings will always contain moisture in vapor form. The amount of airborne moisture present at a given time, is expressed as being relative to the maximum possible at prevailing temperature and is referred to as relative humidity. The relative humidity fluctuates, depending upon temperature, as warm air is capable of retaining more moisture than cold air. When the temperature of humid air drops, condensation will occur on the coldest surfaces, if the temperature falls below dew point (the point at which excessive airborne moisture can no longer be retained). The dew point is normally reached on cold surfaces, but in certain situations, the dew point can occur within the fabric of porous building materials. In normal households, we produce considerable amounts of moisture by using baths, showers, cooking, drying of clothes, use of unflued oil or portable gas heaters and even breathing. If heating and ventilation provisions are inadequate, then condensation is likely to occur. The effects of condensation should be instantly recognisable to most householders. BLACKMOULD, excessive moisture runs down windows particularly in kitchens, bathrooms and bedrooms, often causing decay to timber glazing bars and window sills, and unsightly black mould forms on inner surfaces of external walls, on ceilings and also on clothing and footwear stored in built-in wardrobes. Decorations are spoiled and the general quality of life of the occupants is reduced. liminate all sources of structural damp due to rising damp , penetrating damp, lateral & falling damp; defects to rainwater heads, gutters & downpipes;, faulty plumbing, leaking showers & baths; pointing and external rendering. Do not allow kettles to boil for longer than is necessary. Keep bathroom and kitchen doors closed, when bathing or cooking. Avoid drying clothes indoors, or over radiators. Vent clothes dryers directly outside. Avoid use of unflued oil or portable gas heaters which produce more moisture per litre than fuel consumed. Provide “dry heating”, where possible, via ducted gas or electric heating, or electric convection heaters. Provide adequate ventilation to all occupied rooms, particularly to kitchens, bathrooms and bedrooms. 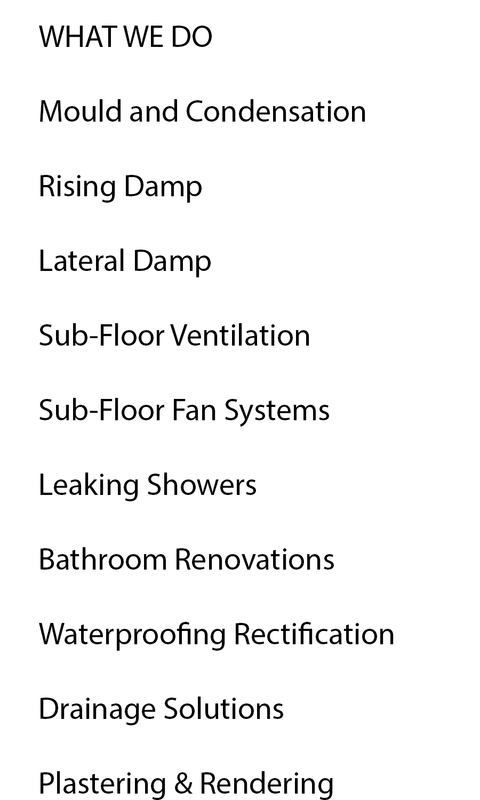 Electric low voltage humidistatically controlled extraction fans are particularly effective when installed in kitchens and bathrooms. Avoid sitting large items of furniture against or adjacent to external walls. Mould removers and anti-mould treatments are also available, which can be very effective in preventing the growth of mould on wall surfaces, particularly where the provision of adequate heating and ventilation is difficult.